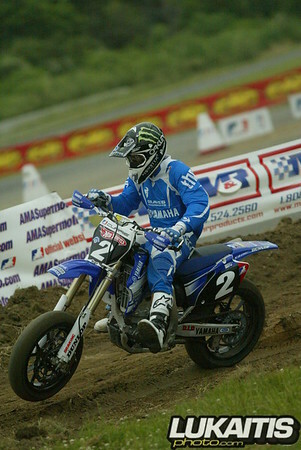 When the AMA was looking for a Northeast point to take its 2007 National series, Englishtown was the most logical choice. The facility was the perfect venue and their brand new road course would be the site of the inaugural event. 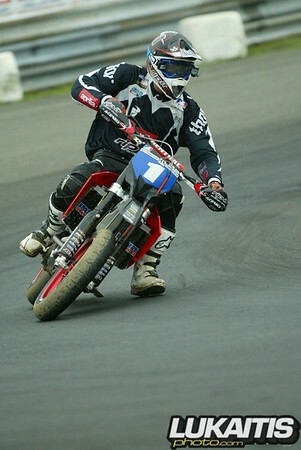 But for a Supermoto to be exciting there has to be a dirt section as well. So practice track designer Carl Anderson was called in to create two exciting motocross style jump sections that received rave reviews from the competitors. Since the series is still in its infancy the pits are an open style with no extra ticket required to get up close and personal with the men (and woman) and their machines. The series is contested by all of the major manufacturers and the entry list reads like a who’s who of motorcycle racing. From motocrossers like David Pingree and Jeff Ward, freestylers like Carey Hart, World Gp riders like Kurt Nicoll and the man behind Troy Lee Designs, Troy Lee himself this sport has it all. Sunday’s event was lightly attended due to the rain in the forecast for the afternoon but those who came to the race saw excellent competition in all three professional classes. Graves Motorsports Yamaha’s Brandon Currie took the class win after taking the pole in his qualifier. He grabbed the early lead running Troy Lee Designs Honda rider wide in the first turn and never looked back. 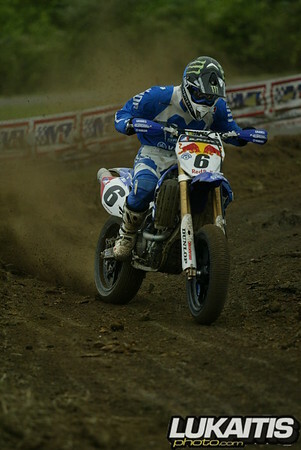 If he did get the chance to see behind him his goggles would have been full of Pingree who kept the Yamaha rider in his sights ready to make the move when Currie would make a mistake. That mistake never came and Currie went on to take the win with Pingree in second and Monster Kawasaki rider Matt Abbott in third. Factory Aprilia Rip It Energy Racing’s Ben Carlson was the class of the Unlimited field taking the advantage from the pole and stretching his lead to a multi-second advantage before backing it down to a close race by the end. Factory HMC KTM teammates Kurt Nicoll and Johnny Lewis rounded out the top three. Although the forecasted rain held off for most of the day, by the time the premier class got started there was a light but steady drizzle coming down. Troy Lee Designs Honda rider Cassidy Anderson grabbed the early lead only to throw it away in the first slippery dirt section. Anderson’s teammate Jeff Ward and Graves Motorsports Yamaha mounted Mark Burkhart showed the rest of the field that this was to be their race eventually pulling out to a 20+ second lead. Ward and Burkhart battled each other tooth and nail as the track conditions deteriorated. Burkhart would go on to take the victory 4+ seconds over Ward with factory KTM rider Troy Herfoss rounding out the podium. 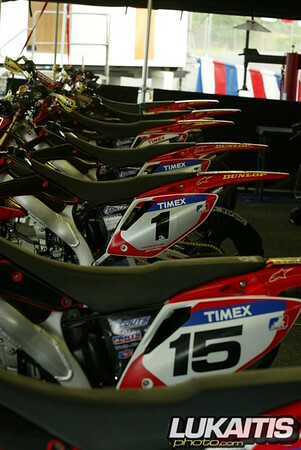 It looks like Supermoto racing is here to stay in the Northeast. With tight racing and exciting action, it appears to be around for a while. Check it out next time it’s around.